the tradition of hard-boiling, colouring and painting chicken eggs for easter is, to say the least, a strange one: it is ultimately based on the misclassification of eggs as “dairy“. 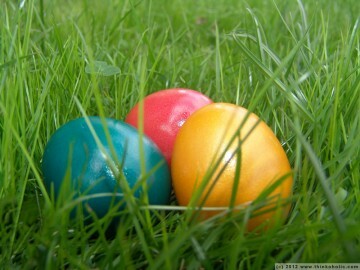 wikipedia says that it was traditional to use up all of the household’s eggs before lent began. meat and dairy are/were forbidden during lent, and eggs were considered dairy (“a foodstuff that could be taken from an animal without shedding its blood”). in order to not waste food, the eggs were hard-boiled during lent, and finally eaten at its end. the article goes on to describe the symbolism of different early types of decoration, but today’s variety of easter eggs seems to have taken off a bit, since the early days. 1 while a single egg contains about 2/3 of the recommended daily cholesterol limit, (1) only some of that ends up in the bloodstream, and (2) the body usually just compensates this by reducing internal production (see also: cholesterol myth #2).